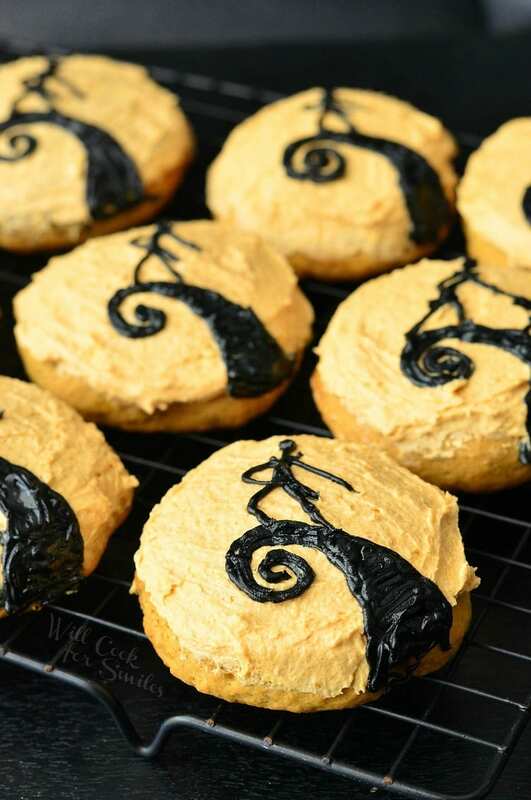 Fun pumpkin cookies to make for a Halloween Party. 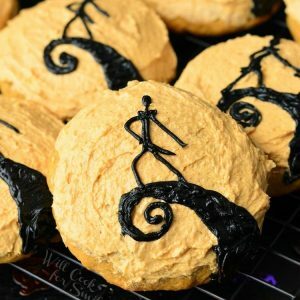 Soft, scrumptious pumpkin cookies topped with pumpkin buttercream frosting and decorated with a classic scene from The Nightmare Before Christmas movie. 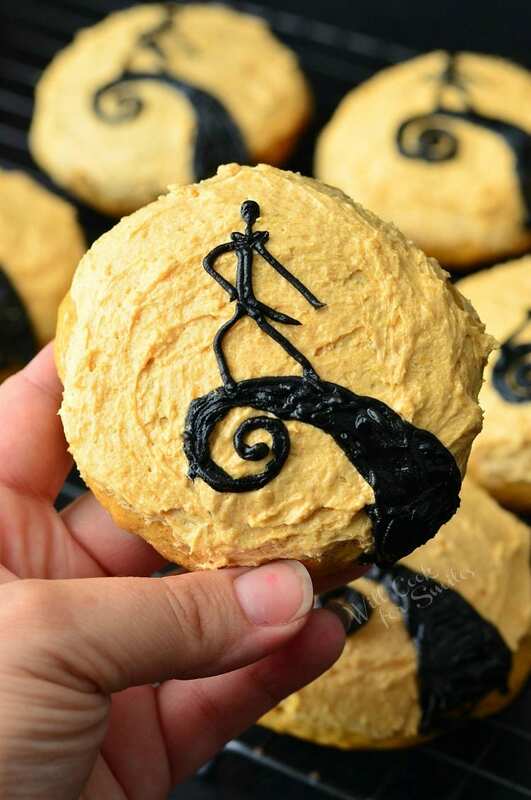 These pumpkin treats for Halloween. So how much do you LOVE this movie? Personally, I looove it and just about everyone I know loves it. I even have friends over for a movie night to watch The Nightmare Before Christmas around Halloween time. 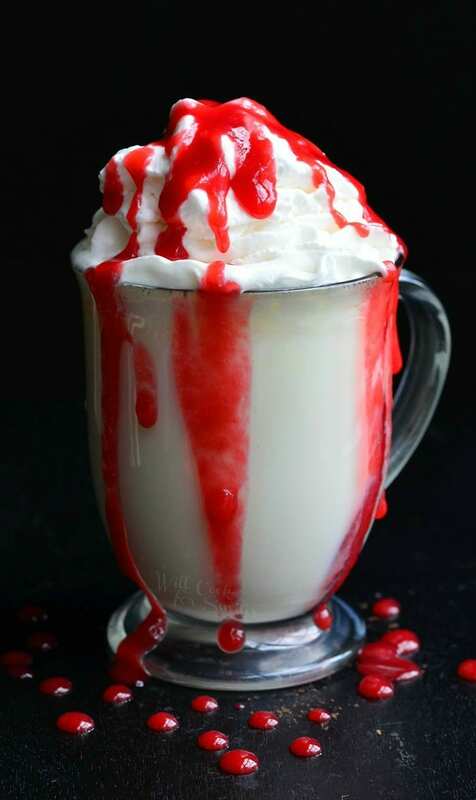 I also make themed snacks and cocktails. 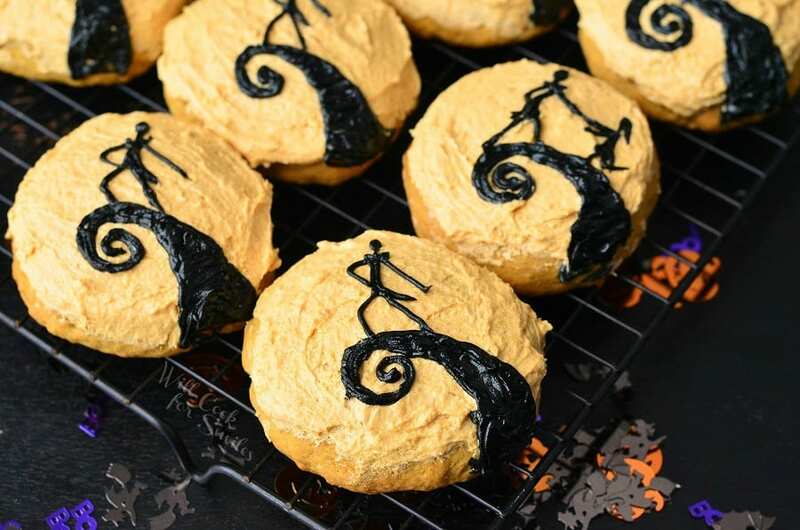 It’s fun and that’s why I made these awesome cookies, because I know that I’m not the only one who watches the movie every Halloween. 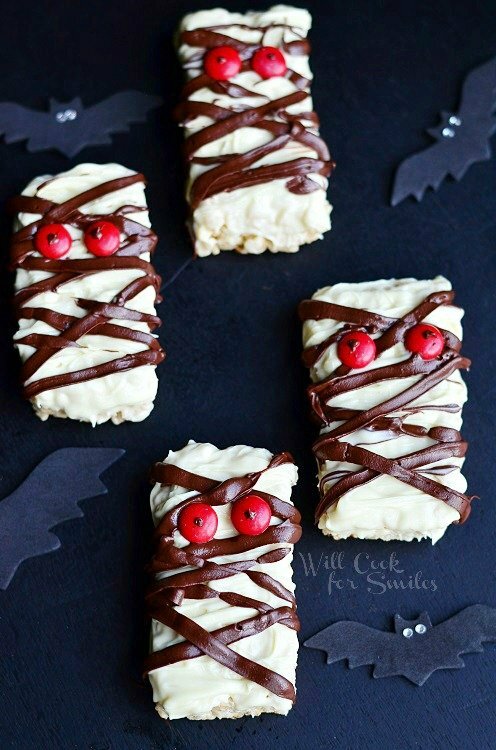 These cookies would be fun for any Halloween parties. They can even be a party activity. 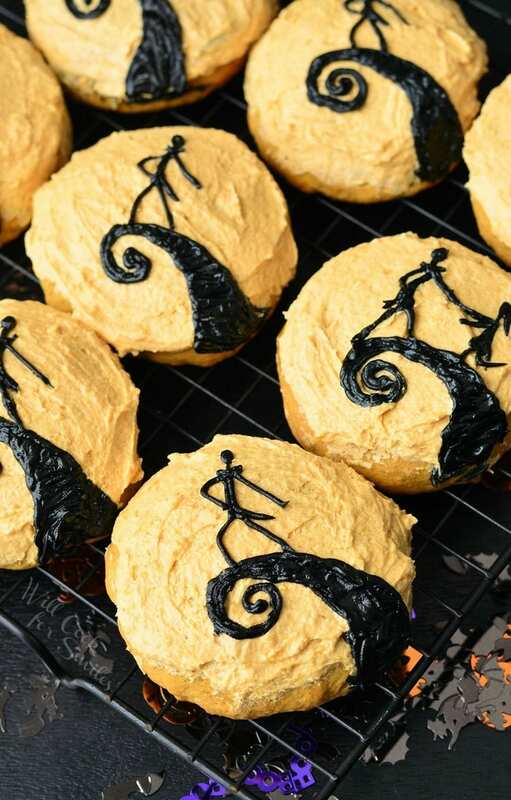 If you prepare the cookies and frost them with pumpkin buttercream frosting ahead of time, you can let the kids (or adults) make their own illustration with black icing. You can play around with the scenes and poses. In the picture below, you can see where I made a different illustration, I made Jack and Sally together. Use your imagination and have fun with it! Speaking of frosting and icing, you can make both homemade or you can use both store-bought. I gave you a recipe for pumpkin frosting because I’m not sure if they actually sell pumpkin frosting pre-made. I know you can find orange frosting at stores around Halloween time but I’m not sure about the pumpkin one. Black icing is available in just about every grocery store, in the baking isle, and since you don’t need that much of it, it’s easier to use pre-made. 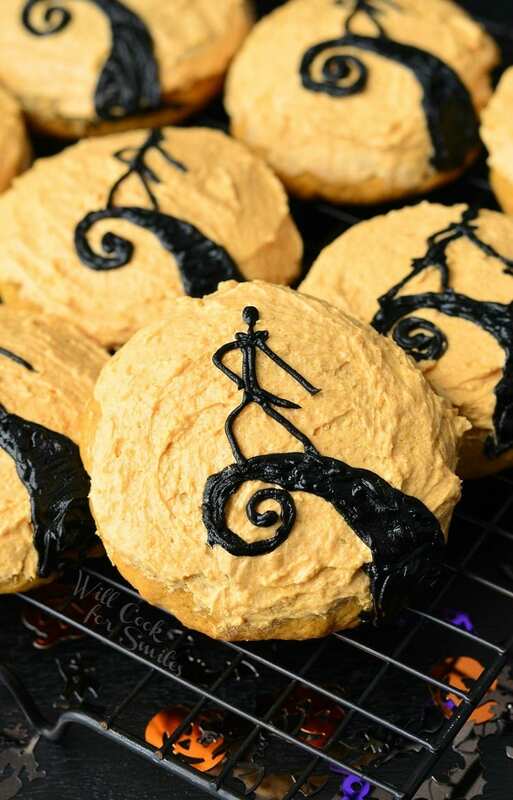 Soft, scrumptious pumpkin cookies topped with pumpkin buttercream frosting and decorated with a classic scene from The Nightmare Before Christmas movie. Beat butter and sugar in a bowl of an electric mixer on medium-high speed for about 2 minutes. Scrape sides and bottom of the bowl. Add egg and beat until combined. Beat in pumpkin and vanilla extract. Scrape sides and bottom of the bowl. While mixer is turned off, add dry ingredients. Mix on low until completely incorporated. Scrape sides and bottom of the bowl and mix a couple more times. Grease your hands and scoop about a tablespoon and a half portion of cookie batter. Gently roll it in a ball and flatten it somewhat. Shape into a nice circle. These cookie will retain shape. Place formed cookies on the baking sheet and gently press your thumb in the middle. (This will help with them raising in the center.) Place cookies on the parchment paper about 2 inches apart. Bake cookies for 11-12 minutes. Take out and repeat with remaining batter. Cool cookies on a wire rack completely before frosting. Beat butter with a paddle attachment in an electric mixer, on medium-high speed, for a couple of minutes. Scrape sides and bottom of the bowl and beat for another couple more minutes until light and fluffy. Switch to a whisk attachment. On low speed, add vanilla, cream, pumpkin, and powdered sugar. Beat on low until sugar is incorporated and raise the speed to medium-high. Beat for a few seconds. 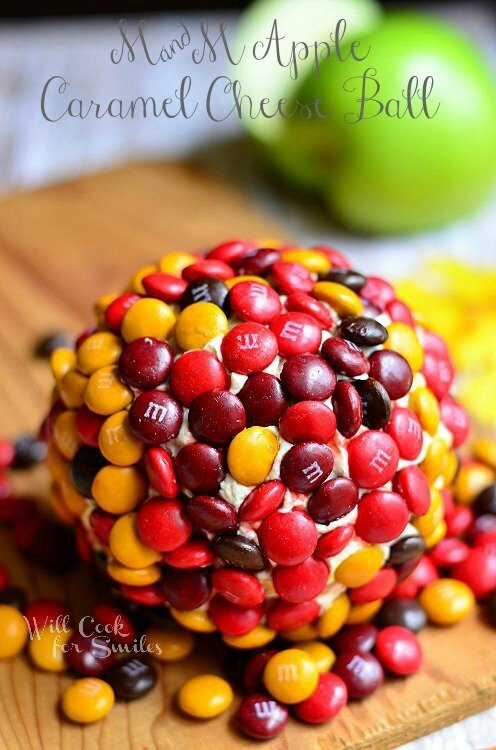 Add food coloring and beat until incorporated. Scrape sides and bottom of the bowl and mix. Set aside until cookies are cooled. Frost cookies evenly to make a nice flat round top. That will resemble the moon. Add black icing to a piping bag that's fitted with a thin attachment meant for writing (#2 Wilton attachment). I recommend making your first illustration on a piece of paper, for practice. Draw the mountain and Jack on the frosted cookies in black icing.